International Cricket Council chairman Narayanswami Srinivasan on Monday withdrew the application for perjury against Board of Control for Cricket in India secretary Anurag Thakur after the matter came up for hearing before the Supreme Court. It is learnt that Shashank Manohar after being elected as the BCCI president on Sunday had told Tamil Nadu Cricket Association (TNCA) representative P S Raman to convey his message to Srinivasan about his request to withdraw the perjury case. After the matter was called out and hearing the parties, and on finding out that the Apex Court wasn't inclined, Srinivasan's counsel Kapil Sibal withdrew the application for perjury, informed a BCCI release. As far as the conflict of interest matter is concerned, the Supreme Court held, inter alia, that they had dealt with the same in their Order of January 22 and as the subject issue is post the final Order, it is for the BCCI to hold its considered decision based on legal opinions that 'conflict of interest' of Srinivasan remains unaltered, until the same is over turned by appropriate Court of law. 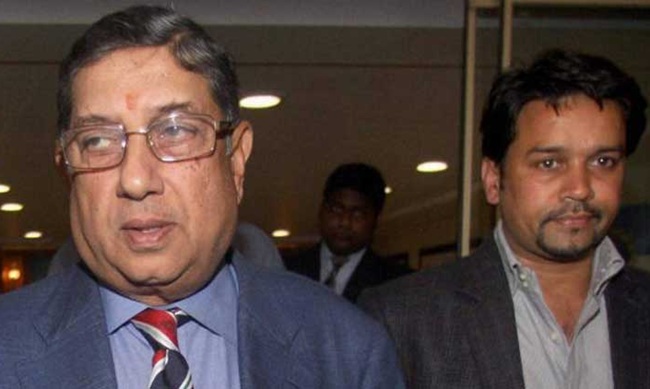 Srinivasan's view of No Conflict may be addressed to by the appropriate Court, if aggrieved. Thus the Hon'ble Court held no reason to provide any further clarification nor to refer it to the Justice Lodha Committee and accordingly based on the detailed order, the Application of BCCI is disposed off. The release also stated that,"It is incorrect that BCCI "withdrew" its application or that the same was 'dismissed' without recording detailed observations".